You can now find me on Pinterest! I have good news and bad news. The good news is that we are learning how to use social media better and have started a Pinterest board and are going to do a live Twitter feed on my website. Please follow us on Facebook, Twitter and Pinterest and Like our Facebook Fan Page. I will also be posting a short video clip each week on my home page to give you a quick tip from my new book, The Emotionally Destructive Marriage: How to Find Your Hope and Reclaim Your Voice. Please join our discussions and let’s do what we can to help women grow to be strong, safe and sane. The bad news is that over 4,000 people on my e-mail list were recently lost and we have not been able to have contact with them over the past few weeks. If you did not receive my last newsletter, it was because your name was one of those accidently deleted. My technical people have been working hard to find you in cyberspace and restore you to our family here. Just click the link below to follow me and start pinning now! Have Your Wings Been Broken? Have you ever felt like your wings were cruelly broken by someone else? When that happened, was there anyone out there who cared? Was there anyone who was willing to bandage your wings and provide a safe sanctuary until you healed? 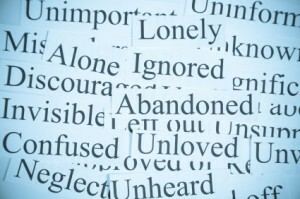 Many abused and battered individuals have experienced such brokenness and need our help. This week I was introduced to Megan, a woman who was once broken and found healing. Now she wants to help other moms who have been in destructive and abusive marriages find their wings again. She wants broken, bruised and battered women to get a fresh start, and she knows first-hand one of the thing they need most is money. To raise funds for their July “person in need,” she is offering this beautiful special edition, sterling silver necklace with freshwater pearl and restored wings. She is hoping to sell 100 necklaces. Selling 100 necklaces means almost $4,000 to help this person in need. If you would like one (or more) of these necklaces for yourself or to give as a gift to a special woman you know, please go to their website at http://giveherwings.com/html/currentFundraiser.html to purchase and read more about this wonderful ministry. You can also read her blog at http://giveherwings.com/index.html. Am I Crazy for Not Being Thrilled With His Changes? Question: I’ve separated but he hasn’t changed. Now what? In January I left my husband of 35 years. His behavior had become so destructive that our adult children were trying to figure out how to see me without him. I presented my concerns to him but got nowhere. It was like a trip down the road to insanity. I felt that leaving was the last resort, but it became the only one I had and the only thing that would get his attention. That has proven to be true. He was “devastated”, “never saw it coming”, and willing to do anything to fix it. Thus began several months of whining, begging, complaining and feeling sorry for himself. He started seeing a counselor but after about 6 weeks quit and started seeing a family friend who happens to be a counselor. I asked him to work on the relationships with our 5 children, become responsible financially, look at why it is ok to lie, break promises, make major decisions independently and lie about them etc. He agreed those were “bad behaviors” and says they will not be repeated. He tells me he has changed and will only do what I want from now on. Now, after 6 months apart I feel like things have changed very little. There is no real plan in place to make amends for financial issues, if anything the relationships with the kids are worse, he still makes excuses and gives himself credit for ” sticking with me through this”. Really? We have been seeing each other a few times a week for the last month or so and I feel like I am going back to being frustrated, confused and preoccupied with trying to fix him when I know I cannot. The counseling seems to be doing very little. I am wondering if he should be continuing to go without me as working on communication seems to be so far from what is really at the root of the matter. I’m wondering if you have any advice. It feels rather hopeless. I get that it will take time but I feel like unless we are doing the right things during this separation, we will not end up where we want to be. I want so badly to do what is “right” before God. I am struggling to determine what that is. We have gone through many difficulties, including the deaths of 2 children, things we had no control or choice about. This entire situation is frustrating and maddening…..it didn’t have to be this way. He is still attending our church so I do not….consequently I feel isolated and like I’m the “wrong” one. It feels like nothing is the way it should be…Forgive my ramblings. Thanks for listening. You can now find me on Pinterest! Leslie's new book, The Emotionally Destructive Marriage: How to Find Your Hope and Reclaim Your Voice is now available via pre-order. 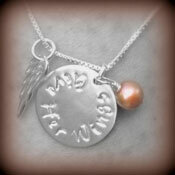 18" sterling silver chain and sterling silver customized "Give Her Wings" wing charm with antique pink freshwater pearl. To win this necklace, please submit your name and a short story as to why it would bless you or someone else to receive it. Entries should be emailed to assistant@leslievernick.com by midnight Monday July 22nd. Due to the issue we had with lost email addresses and our previous newsletter, the winners of The Smart Stepmom by Ron L. Deal and Laura Petherbridge will be announced in the next newsletter. "Leslie is great to work with. She is easily accessible via email or phone. She helped me by giving me a different perspective on my situation which in turn helped me to navigate through the battlefield in my thoughts and emotions and has good tools to help you stay successful."